On 5 October 2016, Chinese Ambassador to the UK H.E. 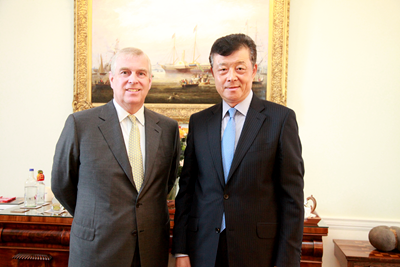 Liu Xiaoming met with HRH The Duke of York at the Buckingham Palace. Ambassador Liu briefed the Duke of York on the sound momentum in the current China-UK relations, and stressed that despite the Brexit referendum, the fundamentals of the relations between the two countries remained unchanged. Leaders of China and the UK have reconfirmed the commitment to building a Global Comprehensive Strategic Partnership for the 21st Century and making joint efforts to create a "Golden Era" of China-UK ties. The recent signing of the Package Investment Agreement for Hinkley Point C represents a new milestone in the pragmatic cooperation between the two countries. China is willing to work with the Royal Family and all strands of the British society to strengthen the friendly exchanges and cooperation between the two countries and take the bilateral relations to a new height. 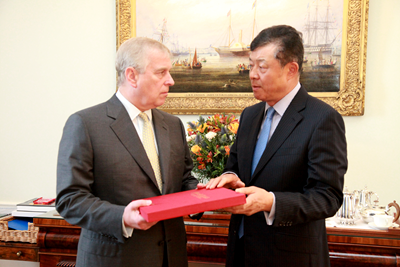 The Duke of York said he is glad to see the China-UK relations maintaining a good momentum. The uncertainties following the Brexit referendum will not stop the UK from continuing its commitment to the development of China-UK relations and becoming global partner of China. He expressed his confidence in the future of China-UK relations and the willingness of himself and the British Royal Family to work for better mutual understanding and friendly cooperation between China and the UK in the new era. Ambassador Liu briefed the Duke of York on the progress of "Belt and Road" initiative and presented a relevant book on the subject to the Duke.